Eye tracking is a process that is developed around 4 months of age. It is when a child is able to follow an object with his eyes. However, a child will not be aware when you take an object away from him because he does not realize that the object is out of sight. Around 4-8 months of age, babies develop a better visual acuity and a more mature motor control. This will lead the infant to reach for objects, regardless of how hidden they are. This is indicative that the child is beginning to realize that the object that is out of sight is still there. Around 8-12 months of age, memory is developed to the point that they can remember the object. If an object is completely out of sight, they will still look for it. This is precisely why they enjoy playing Peek-a-boo and love removing cloths to discover hidden objects. Object permanence is the process of understanding that an object still exists, even though it cannot be touched or heard. Various other pathways are being developed at this stage, such as the visual and motor pathways, and the ability to grasp/reach objects —all critical for object permanence. The concept of object permanence is significant in the role of the theory of cognitive development —introduced by Jean Piaget. During this sensorimotor stage of development, he suggested that infants understand the world through motor abilities such as vision, taste, touch, and movement. Infants start out being egocentric meaning that they have no concept of a world existing separate from their own point of view and experience, but they gain this insight afterward. This occurrence, however, comes with a cost: separation anxiety. Separation anxiety leads to clinginess and shyness that the child experiences around unfamiliar people. Why does this occur? The baby begins to feel anxious now that they remember that their mom or dad has left and is no longer there. Object permanence is critical because it brings us the ability to understand that objects that we have never seen, still exist. Without ever having been to Italy, you still know that the leaning Tower of Pisa is there. 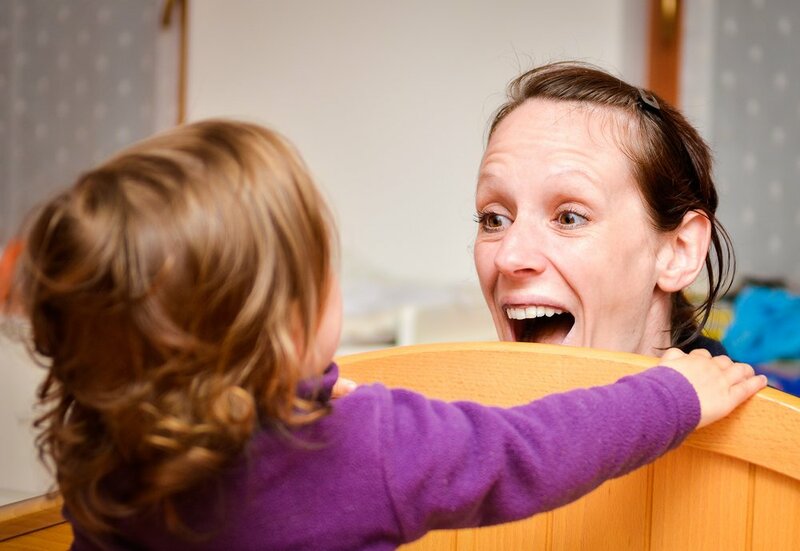 Whenever you start playing Peek-a-boo with your child and she responds with laughter, it is a sign that your child has obtained this new perception. Laughter and smiles are your baby’s way of communicating these cognitive developments. These forms of communication reveal that the child has understood the concepts underlying these games. Whenever you start playing peek-a-boo with your child and he/she responds with laughter, it is a sign that your child has obtained this new perception. Laughter and smiles are your baby’s way of communicating these cognitive developments.